The Canadian skimo story of this season so far is Melanie Bernier’s bronze medal at a World Cup sprint race in Val Comelico, Italy. 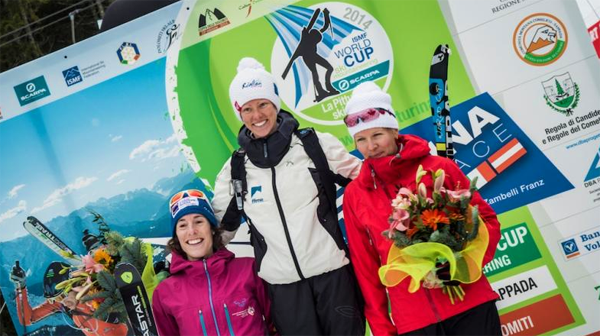 This marks the first ever skimo World Cup podium placing for Canada! Melanie on the very right. Canadian current skimo racing season has been severely compromised so far – two races got cancelled due to extremely low temperatures, one was very compromised due to weather as well – which leaves us only with one proper race. First scheduled race was cancelled – Dec 7, 2013 at COP in Calgary. Second one at Castle Mountain was run on a very limited course – Jan 11, 2014. Third round, the Ken Jones Classic, was cancelled – Feb 8, 2014. Fourth round, at Whitewater Resort, went as scheduled – Feb 22, 2014. Two Americans are currently leading the men’s Canadian Series! Marg Fedyna leads 19-year old Katarina Kuba and Melanie Bernier who spent most of her season racing on World Cups in Europe.